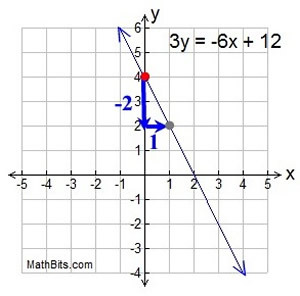 The basic method of graphing a straight line is to prepare a table (or T-chart) of x-values and y-values to obtain points, and to plot these points. When dealing with straight lines, with constant (never changing) slopes, only a few points (actually only two) are needed to produce the line. Choosing Chart Values: When choosing x-values for the chart, choose both positive and negative values. This is a good habit to develop for dealing with other types of graphs. Also choose at least three points. Yes, two points will determine a line, but if you make a mistake you will never know since you created a straight line (but the wrong one). If you make a mistake with one of three points, you are more likely to see that the points do not form a straight line. We are going to choose 5 x-values for our chart. You may need to rearrange your equation until is starts with "y = ". Plot (x,y) on the coordinate grid to reveal the graph. Be sure to include all of the "nice" graph items, such as labeling the x and y axes, labeling the scales on the axes (at least to 1 unit on both axes), and placing the statement of the equation on the graph. Use a ruler, straight edge or a folded piece of paper to draw lines. Make them look like "straight" lines and produce an accurate graph. Linear equations often appear in the form y = mx + b. In this form, m is the slope of the line and b is the y-intercept (where the line crosses the y-axis. ), thus its name "Slope - Intercept Form". Let's take another look at the example above, y = 2x + 3. 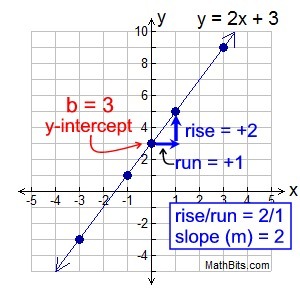 We can see that y = 2x + 3 is in the Slope - Intercept Form, with m = 2 and b = 3. We could have graphed this line without completing a table or chart, by simply using where the line crosses the y-axis and its slope. Start by plotting the y-intercept (b): b = 3 or (0,3). Choose a test point: To guarantee you did not make a mistake when graphing with the Slope - Intercept Form, choose a test point that makes the equation of the line true. (That is, when you plug the test coordinates (x,y) into the equation, you get a true result.) Plot this test point. If the test point is on the line you drew, you can be pretty sure your work is correct. Let's look at another example where the form y = mx + b is "hiding". At first glance, it appears that this line is not a candidate for the Slope - Intercept Form. But, if we use our algebra skills, we can re-write this equation so that it fits the Slope - Intercept Form of y = mx + b. We need the equation to be "y = ", not "3y =". If we divide ALL terms by 3, we will get the equation we need. We now have the form y = mx + b. The y-intercept (b) is +4. Plot this point first, (0,4). The slope (m) is -2. So the rise/run = -2/1. Starting at the y-intercept, go down 2 units and right 1 unit. This new location (1,2) is another point on the line. Draw the line.